Aim: This study aims to assess the diagnostic performance of 18F-fluorodeoxyglucose-positron emission tomography/computerized tomography (18FDG-PET/CT) compared to whole body (WB) magnetic resonance diffusion-weighted imaging (DWI) with background body signal suppression (MR/DWIBS) in lesions detection in patients with recurrent breast cancer. Materials and Methods: Twenty-three female patients with suspected breast cancer recurrence by clinical, laboratory, or conventional imaging underwent both 18FDG-PET/CT and WB MR/DWIBS. WB 18FDG-PET/CT was performed using the standard technique. WB MR/DWIBS acquired sequences were WB DWI with short tau inversion recovery (STIR), coronal T1, and coronal STIR. Both 18FDG-PET/CT and WB-magnetic resonance imaging/DWIBS were independently interpreted using visual qualitative and quantitative analysis. Pathological findings and combined clinical/radiological follow-up data were used as a reference standard. Sensitivity, specificity, positive predictive value (PPV), negative predictive value (NPV), and overall accuracy were calculated for both techniques. Results: PET/CT demonstrated higher specificity and sensitivity indices than MR/DWIBS in the detection of the nodal and distant lesions, while the latter displayed higher sensitivity in the detection of local breast lesions. The overall sensitivity, specificity, NPV, PPV, and accuracy of PET/CT were 84.8%, 86.3%, 90.4%, 78.7%, and 85.4% versus 82.1%, 78.0%, 85.2%, 74.0%, and 80.5% for MR/DWIBS. A high degree of agreement existed between PET/CT and MR-DWIBS. Conclusion: 18FDG-PET/CT is more sensitive and has superiority in the assessment of nodal and distant lesions than DWIBS that has a potential superior role in the assessment of local breast lesions. DWIBS has a promising and helpful complementary tool for 18FDG-PET/CT in the evaluation of patients with proven malignancies. The second leading cause of death in developed countries is cancer. In developing countries, it is also, among the three leading causes of death for adults, and is responsible for 12.5% of all deaths worldwide. Once a malignant tumor is detected, staging is important for treatment planning and determining prognosis. Imaging plays a pivotal role in cancer staging. It is also of great importance in monitoring response to therapy and the detection of tumor recurrence. Advances and ongoing improvements in imaging technologies have improved the sensitivity of breast cancer detection and diagnosis. However, it is still the case that no single imaging modality can identify and characterize all breast abnormalities and a combined modality approach will continue to be necessary. As the survival time of patients is now longer, accurate detection, and diagnosis of metastatic diseases by whole body (WB) imaging becomes more important.18 Fluorodeoxyglucose-positron emission tomography/computerized tomography (18 FDG-PET/CT) is the usual modality for the assessment of metastatic diseases. The visualization and measurement of the diffusivity of water molecules in the human body by diffusion-weighted imaging (DWI) actually represents a fingerprint of the cellular characteristics of the tissue. This is because biological tissues are composed of barriers that restrict-free diffusion of water molecules such as cell membranes, fibers, and macromolecules. The major role of DWI in clinical routine is in the early detection of cerebral ischaemia, but changes in tissue water diffusion properties can be helpful for the detection and characterisation of pathological processes, including cancer, in any part of the body. DWIBS allows acquisition of volumetric diffusion-weighted images of the entire body and also has unique features different from conventional DWI.,, The fact that MR/DWIBS does not require the use of ionizing radiation or contrast agents had advantages; because it means that it is less invasive and more widely available compared to 18 FDG-PET/CT. DWIBS gives functional information and can be used for the detection and characterization of pathologic processes, including malignant tumors; it may, therefore, be of value in staging and follow-up imaging of malignant tumors. DWIBS techniques coupled with anatomic conventional morphologic techniques allow greater lesion conspicuity and characterization compared with other functional and anatomic imaging modalities. The aim of the study is to assess the diagnostic performance of 18 FDG-PET/CT compared to WB MR/DWIBS in patients with recurrent breast cancer. We used a prospective, comparative, cross-sectional study design with a purposeful convenience sample collected from the National Cancer Institute (NCI) and Zagazig University Hospitals. This study included a total of 23 treated breast cancer women with suspected recurrence by clinical, laboratory, or conventional imaging. Patients who had double primary malignancy, fulminant infectious disease, those who were diabetics and those with an estimated life expectancy <6 months were excluded from the study. Patients who met the eligibility criteria underwent full clinical examination, laboratory tests and conventional imaging (including sonomammography, ultrasonography, CT scans of the chest, abdomen, and pelvis as well as bone scan),18 FDG-PET/CT, and WB-MRI/DWIBS that were performed with maximum 1 month time interval in-between. All patients were followed up from 6 months to 1 year for the evaluation of lesions behavior over time. Malignant lesions included lesions documented pathologically or those that progressed with time and/or lesions that regressed or cured after specific therapy. Benign lesions included lesions documented pathologically or those that regressed spontaneously or remain stationary without therapy. On WB-MR/DWIBS, lesion was defined as: An area with signal intensity equal or higher than the signal intensity from the organ with the highest signal intensity. LNs larger than 10 mm in short-axis diameter were considered positive. LN size was measured in the coronal plane on T1-weighted and short tau inversion recovery (STIR) images. LNs and masses were not measured on diffusion-weighted images. For each distant region, any areas with altered signal in T1-weighted (T1WI) or STIR, showing signal intensity in DWIBS higher than surrounding tissues. 18 FDG-PET/CT scan was done at the Nuclear Medicine Unit of NCI. Ethical approval was granted by the Institutional Review Board before the study started. Informed consent was obtained from all patients before they were enrolled in the study. 18 FDG-PET/CT scan was performed on an integrated PET/CT system with 16-slice CT (GE Medical Systems). All patients were asked to fast for 6 h before scan. The patients were instructed to avoid any kind of strenuous activity before the examination and following injection of the radioisotope to avoid physiologic muscle uptake of FDG.18 F-FDG administered in a standard dose of 5.5 MBq/Kg, 60 min before scanning. Patients were asked to rest in a quiet room, devoid of distractions, and they were also asked to keep their movements, including talking, at an absolute minimum. The patients were positioned in a comfortable head fixation with arms up. The PET emission scan was performed over several bed positions (5–7) for 2 min per bed position with an axial field of view of approximately 21.6 cm per bed position and in-plane spatial resolution of 2 mm covering the same field of view as with CT. Transaxial PET and CT images were first acquired. These are then reformatted into coronal and sagittal images. For each of these sets of PET and CT images, corresponding “fusion” images, combining the two types of data, also were generated. PET image data sets were reconstructed using CT data for attenuation correction, and coregistered images were displayed using special software. PET/CT scan was interpreted by an expert nuclear medicine physician. Whole-body MRI DWIBS protocol design was conducted on MRI Achieva, Philips 1.5 T scanner. Q-body coil used, with the patient positioned feet first on an extended anatomical coverage table, based on the rolling-table technology (MobiTrak, Philips). The used sequences were: Coronal T1-weighted Turbo Spin Echo (TSE), Coronal STIR from the head to the mid-thigh, and axial DWIBS single-shot echoplanar imaging (ss-EPI). The coronal T1WI was with Q body coil with parameters: slice thickness 6 mm, gap 1 mm, number of slices for station, 39, field of view 530 × 265, acquisition matri × 208 × 287, and reconstruction matri × 512. The coronal STIR sequence was acquired with the same parameters as coronal T1WI except TR/TE 64; inversion time, 165 ms; acquisition matrix, 336 × 12; both T1WI and STIR images were acquired in free breathing. DWIBS was acquired in free breathing and the axial plane, using Q body coil with the following parameters: Ss-EPI; TR/TE, shortest; inversion time, 180 ms; slice thickness, 6 mm; gap, 0 mm; EPI factor, 61; b values 0–1000 s\mm2. The total examination time was average about 40 min for WB DWIBS. No contrast agent applied. Reconstructed DWIBS images from axial plane (in coronal, sagittal planes as well as maximum intensity projection (MIP), and volumetric view), were obtained and merged with T1 and STIR to form fused T1/DWIBS and STIR/DWIBS fused images. Color-coded fused T1-DWIBDS images were generated at Philips workstation. Apparent diffusion coefficient (ADC) maps were automatically generated from DW images by the MR software. Data were coded and entered using the statistical package SPSS (Statistical Package for the Social Science; SPSS Inc., Chicago, IL, USA) version 22. Data were summarized using mean, standard deviation, median, minimum, and maximum for quantitative variables and frequencies (number of cases) and relative frequencies (percentages) for categorical variables. Receiver operator characteristic (ROC) curves were derived and area under the curve (AUC) analysis performed to get the best cutoff values for detecting malignant lesions. Accuracy measures (sensitivity, specificity, positive predictive value [PPV], and negative predictive value [NPV]) with their 95% confidence intervals were calculated for PET CT and DWIBS. P < 0.05 was considered statistically significant. Twenty-three female patients with mean age 56 and age range 47–65 years old were included in the current study out of them 15 (65.2%) were premenopausal. Overall clinicopathological and or follow-up data results analysis demonstrated a total of 185 lesions as standard lesions (73 benign and 112 malignant). Out of the 185 total lesions, only 14 (7.5%) were local breast lesions, 5 benign and 9 malignant. 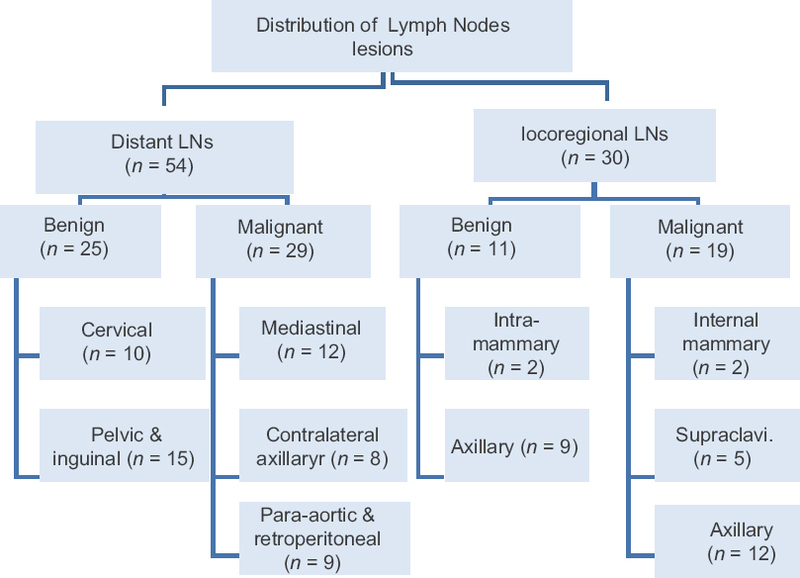 However, high frequency of both locoregional (n = 30) and distant nodal lesions (n = 54) was noted with more malignant than benign LNs (n = 48 vs. 36) The axillary and the mediastinal LNs were most commonly encountered among the locoregional and the distant metastatic LNs (n = 12 for each) respectively [the sites and distribution of the locoregional and distant LNs is displayed in [Figure 1]. Furthermore, a high frequency of distant lesions (n = 87) was seen with higher number of malignant lesions (n = 55) than benign (n = 32). Bone and lungs were the most common organs of distant lesions (40 and 27 respectively) while other organs were less frequently involved, such as liver, peritoneum, pleura, suprarenal gland, and adnexa. A statistically significant difference (P > 0.005) was found between malignant and benign osseous and LNs lesions [Table 1]. PET/CT characterized 105 lesions as malignant (8 breast, 19 regional LNs, 27 distant LNs, and 51 distant metastatic lesions) and 80 lesions as benign (6 breast, 11 regional LNs, 27 distant LNs, and 36 distant lesions), while MRI-DWIBS characterized 108 lesions as malignant (10 breast, 19 regional LNs, 29 distant LNs, and 50 distant metastatic lesions) and 77 as benign (4 breast, 11 regional LNs, 25 distant LNs, and 37 distant lesions) [Table 2]. PET/CT correctly diagnosed 158 lesions 63 benign (4 breast, 9 regional LNs, 23 distant LNs, and 27 distant lesions) and 95 malignant (7 breast, 17 regional LNs, 25 distant LNs, and 46 distant lesions) versus 149 lesions for MRI-DWIBS 57 benign (3 breast, 8 regional LNs, 20 distant LNs, and 26 distant lesions) and 92 malignant lesions (8 breast, 16 regional LNs, 24 distant LNs, and 44 distant lesions). Of the 14 breast lesions DWIBS characterized 10 as malignant and 4 as benign with one false negative (88.9% sensitivity) and 2 false positive (60.0% specificity) while PET/CT characterized 8 lesions as malignant and 6 as benign with 2 false negative (77.8% sensitivity) and 1 false positive (80.0% specificity). PET/CT has comparable results to MRI-DWIBS in the diagnosis of benign and malignant locoregional LNs; both modalities characterized 19 as malignant and 11 lesions as benign. MRI-DWIBS had 3 false negative (84.2% sensitivity) and 3 false positive (72.7% specificity), while PET/CT had 2 false negative (89.5% sensitivity) and 2 false positive (81.8 specificity). In respect to distant LNs, DWIBS characterized 29 as malignant and 25 as benign with 5 false negative (82.8% sensitivity) and 5 false positive (80.0% specificity) while PET/CT characterized 27 as malignant and 27 as benign with 4 false negative (86.2% sensitivity) and 2 false positive (92.0% specificity) [Table 3]. PET/CT had 10 false-positive and 17 false-negative lesions [lesions distribution was illustrated in [Table 3]. The reported findings for the false-positive results include; subcutaneous-infected breast nodule, lymphadenitis, postoperative sequelae, pulmonary granulomatous nodule, spondylodiscitis, and osteomyelitis. Other causes such as benign suprarenal adenoma, fibroadenoma, and hepatic regeneration nodules with increased FDG uptake were also detected. The false-negative PET/CT results for local breast lesions were demonstrated in two lesions, one missed lesion was seen as isodense lesion in the operative bed infiltrating the pectoralis muscle, while the other was diagnosed as hard subcutaneous nodule with no significant metabolic activity (sclerosed recurrent malignant nodule). Four small-sized metastatic nodal lesions with insignificant 18 FDG uptake were recorded as false-negative lesions; these nodal lesions progressed with time. Early bone marrow-based lesions, sclerotic osseous lesions and subcentimetric pulmonary nodules that lack FDG uptake are the main contributing factor for false-negative PET/CT results at distant lesions. However, 16 false-positive MRI-DWIBS lesions were noted [their distribution was also illustrated at [Table 3]. Infections or Inflammation were the most common causes for false-positive local lesions as well as nodal and pulmonary lesions (>1 cm). Osseous spondylodegenerative, osteomyelitis, and porotic changes as well as imperfect monitoring to therapy response were the main contributing factors for false-positive bone lesions. A single instant of suprarenal adenoma, as well as hepatic atypical posterior hemangioma, were false-positive lesions in DWIBS. On the other hand, a total of 20 false-negative lesions were demonstrated in DWIBS; the local breast lesions were missed due to overlapping pathology (fibrocystic changes, mastitis and/or postoperative sequelae). The false-negative nodal and pulmonary lesions are related to operative bed or posteriorly located isointense lesion infiltrating the chest wall muscles. Moreover, motion artifacts, poor yield in thoracic and around diaphragmatic regions, cortical based lesions, the overlapping spondylodegenerative, and porotic changes were the main factor in false-negative results. The overall sensitivity, specificity, PPV, and NPV of PET/CT were 84.8%, 86.3%, 90.4%, and 78.7% versus 82.1%, 78.0%, 85.2%, and 74.0% for MRI-DWIBS, respectively [Table 3]. [Table 4] shows a comparison by site between PET/CT and DWIBS using different parameters of sensitivity and specificity indices in the assessment of local, nodal, and distant lesions. The overall results showed the superiority of 18 FDG-PET/CT over DWIBS in specificity indices in all sites. On the other hand, the sensitivity and NPV indices for DWIBS were only significantly higher in local breast lesions. In contrast, PET/CT was significantly higher than DWIBS in sensitivity and specificity indices in distant lesions. ROC curves were derived and AUC analysis performed to determine a cutoff value for both maximum standardized uptake value (SUV max) (A) and ADC mean (B) that discriminate between malignant and benign breast lesions and yield the best compromise between sensitivity and specificity for PET/CT and MRI-DWIBS respectively for the assessment of local breast lesions [Figure 2] and locoregional LNs lesions [Figure 3]. For local breast lesions, the ROC curve determined SUV cutoff value 2.050 with 97.3% sensitivity and 75.0% specificity. On the other hand, the ROC curve determined ADC cutoff value 0.9415 × 10−3 mm 2/s with 100% sensitivity and 84.2% specificity. Both have statistically significant difference (P < 0.0001). Regarding the locoregional nodal lesions, the ROC curve determined SUV cutoff value 2.250 with 94.7% sensitivity and 85.0% specificity, and ADC cutoff value 1.150 × 10−3 mm 2/s with 91.7% sensitivity and 68.4% specificity. Both have statistically significant difference (P < 0.0001). This current prospective study is a trial to illustrate the efficacy of DWIBS in comparison with 18 FDG-PET/CT in the assessment of patients with recurrent cancer breast. This comparison entails local breast lesions, locoregional and distant LNs as well as distant lesions including osseous and pulmonary in addition to other miscellaneous distant sites. To the best of our knowledge, no prior studies using DWIBS in comparison with 18 FDG-PET/CT in the assessment of breast cancer patients exist in the literature. However, DWIBS has been reported related to other pathologies. The differentiation between benign and malignant multicentric breast lesions is critical issues in local assessment of breast cancer.18 FDG-PET/CT as a multimodality imaging technique is required to help in solving questionable or indeterminate breast lesions either initially or posttherapy. Furthermore, DWIBS recently introduced as a multimodality technique that showed better soft-tissue differentiation, contrast resolution, provide a better sensitivity, and acceptable specificity. Many studies illustrated the role of 18 FDG-PET/CT in the evaluation of suspicious breast lesions, and also support our PET-CT results with variable sensitivity values ranging between 80 and 90% and specificity values between 71% and 95%. Better tissue differentiation and higher spatial resolution of DWIBS were the main contributing factors in a better yield of DWIBS results in the locoregional assessment of breast cancer lesions compared to PET/CT [Figure 4]. Stadlbauer et al. have similar yet with high sensitivity indices results as they performed a full quantitative and qualitative interpretation of DWIBS and found that DWIBS is a superior technique than the conventional DWI with accuracy of 96.5%. Nodal (regional and distant) assessment is a crucial issue for all diagnostic modalities. The current imaging techniques are mainly based on morphological criteria in the assessment of nodal lesions either locoregional or distant and do not have enough accuracy to characterize the normal size involved LNs. Furthermore, exclusion of malignancy from benign nodal lesions larger than 1 cm is considered still questionable. In this study, more or less similar number of false-negative results was demonstrated in both techniques. Both techniques have acceptable power to detect malignancy in normal size nodes with better scale for PET/CT in sensitivity (87.5% compared to 83.3% of DWIBS) and specificity (88.9% compared to 77.8% of DWIBS). On the other hand, significant higher false-positive nodal lesions were demonstrated by DWIBS that were metabolically inactive in PET/CT [Figure 5]. The disagreement mainly concerned in the mediastinal and hilar areas where DWIBS-MRI has a lower performance, partly due to respiratory and cardiac motions. The addition of quantification assessment by ADC may help in attaining better specificity, in particular, the locoregional LNs (cutoff value was 1.150 × 10−3 mm 2/s with 91.7% sensitivity and 68.4% specificity). The added value of ADC value in DWIBS quantification try to add in solving these false-positive results; however, artifacts and native restriction pattern of normal nodes of DWIBS play a central role in such inferiority of its results compared to PET/CT. Chemotherapy effect may produce false-negative results on DWIBS, as anticancer therapy may produce cell membrane rupture and cause cell necrosis, resulting in decreasing cell density, which increases the mobility of water molecules accompanied with low signal intensity on DWIBS. However, others demonstrated that DWIBS is superior to PET/CT and bone scan in the detection of bone metastases especially in pelvic cavity with the advantage of no ionizing radiation and the many false-negative results of PET/CT overlocked by degenerative changes. Our results showed clearly higher specificity for 18 FDG-PET/CT (81.82%) in the characterization of pulmonary lesions compared to MR DWIBS (63.64%). Moreover, the sensitivity indices were also significantly higher (90.0%) than that of DWIBS (65.0%). Technical difficulties and motion artifacts in thoracic region are the main reasons for relatively high false-positive and false-negative DWIBS results. The current work suffered from several limitations: This study included a limited number of patients with different pathology, age and duration of disease; therefore, no significant difference was achieved between DWIBS and PET/CT in overall results. The reference of standard lesions in the current study was partially based and not fully on histopathological data, as multiple biopsies from several lesions is not ethically or clinically applicable. Instead, clinical outcome data obtained through clinical follow-up, multiple laboratory and radiological imaging evaluation were satisfactory and used as a reference. The limited number of benign lesions particularly in local assessment interfered with the achievement of a conclusive result in differentiation between benign and malignant lesions in both techniques. Accurate comparative quantification using ADC and SUV was not done during the current study as technical and motion artifacts in DWIBS interfere with performing such comparative quantification. Finally, the availability and cost stay behind this limitation. Considering its safety and patient tolerance, the future alternative role of DWIBS technique compared to PET/CT has to be determined. Although diffusion images are a powerful new tool that improves the sensitivity and specificity of classical anatomical image but not providing metabolic information, it is really unlikely to completely exclude PET/CT. 18 FDG-PET/CT is more sensitive and has superiority in the assessment of nodal and distant lesions in patients with recurrent breast cancer than DWIBS that have a potential superior role in the assessment of local breast lesions. DWIBS has a promising complementary tool for 18 FDG-PET/CT in the evaluation of patients with malignancies. Further studies should be recommended to minimize its artifacts and improve its feasibility for diagnosis. Kwee TC, Takahara T, Ochiai R, Nievelstein RA, Luijten PR. Diffusion-weighted whole-body imaging with background body signal suppression (DWIBS): Features and potential applications in oncology. Eur Radiol 2008;18:1937-52. Andreea G, Pegza R, Lascu L, Bondari S, Stoica Z, Bondari A. The role of imaging techniques in diagnosis of breast cancer. Curr Health Sci J 2011;37:2. Tanaka Y, Nakanishi K, Nakazawa T, Ueda T, Osaka/JP. Diffusion weighted whole-body imaging with back ground signal suppression (MR-DWIBS) VS 18F-fluorodeoxyglucose (FDG)-positron emission tomography (PET)/computed tomography (CT) in metastatic disease. European Congress of Radiology; 2015 March 4–8;Vienna, Austria. Madueño G. Diffusion-weighted whole-body imaging with background body signal suppression (DWIBS): A useful tool in daily practice. European Congress of Radiology; 2012 March 1-5;Vienna, Austria. Stadlbauer A, Bernt R, Gruber S, Bogner W, Pinker K, van der Riet W, et al. Diffusion-weighted MR imaging with background body signal suppression (DWIBS) for the diagnosis of malignant and benign breast lesions. Eur Radiol 2009;19:2349-56. Takahara T, Imai Y, Yamashita T, Yasuda S, Nasu S, Van Cauteren M, et al. Diffusion weighted whole body imaging with background body signal suppression (DWIBS): Technical improvement using free breathing, STIR and high resolution 3D display. Radiat Med 2004;22:275-82. Padovano F, Calandriello L, Maggi F, Botto A, Larici AR, Bonomo L. et al. Whole-body magnetic resonance imaging (WB-MRI) including diffusion-weighted imaging with background signal suppression (DWIBS) vs. 18F-FDG-PET/CT in the study of malignant tumours. European Congress of Radiology; 2013 March 7-11;Vienna, Austria. Kwee TC, Takahara T, Vermoolen MA, Bierings MB, Mali WP, Nievelstein RA, et al. Whole-body diffusion-weighted imaging for staging malignant lymphoma in children. Pediatr Radiol 2010;40:1592-602. Sushil GK, Devidas SK, Smita BS. DWIBS imaging: Modifying MRI to monitor metastases. J Clin Diag Res 2011;5 Suppl 2:1410-2. Gu J, Chan T, Zhang J, Leung AY, Kwong YL, Khong PL, et al. Whole-body diffusion-weighted imaging: The added value to whole-body MRI at initial diagnosis of lymphoma. AJR Am J Roentgenol 2011;197:W384-91. Goudarzi B, Kishimoto R, Komatsu S, Ishikawa H, Yoshikawa K, Kandatsu S, et al. Detection of bone metastases using diffusion weighted magnetic resonance imaging: Comparison with (11) C-methionine PET and bone scintigraphy. Magn Reson Imaging 2010;28:372-9. Barragan HM, Valtierra Rivera A, Mondragon JD, Jiménez Zarazúa O, Ortiz-Retana J, Altamirano Ley J, et al. Detection of bone metastases through diffusion-weighted whole-body imaging with background body signal suppression (DWIBS). European Congress of Radiology; 2016 March 2-6;Vienna, Austria. Nechifor-Boilă IA, Bancu S, Buruian M, Charlot M, Decaussin-Petrucci M, Krauth JS, et al. Diffusion weighted imaging with background body signal suppression/T2 image fusion in magnetic resonance mammography for breast cancer diagnosis. Chirurgia (Bucur) 2013;108:199-205. Maggialetti N, Ferrari C, Minoia C, Asabella AN, Ficco M, Loseto G, et al. Role of WB-MR/DWIBS compared to (18) F-FDG PET/CT in the therapy response assessment of lymphoma. Radiol Med 2016;121:132-43. Heijnen LA, Lambregts DM, Mondal D, Martens MH, Riedl RG, Beets GL, et al. Diffusion-weighted MR imaging in primary rectal cancer staging demonstrates but does not characterise lymph nodes. Eur Radiol 2013;23:3354-60. Cheng L, Blackledge MD, Collins DJ, Orton MR, Jerome NP, Feiweier T, et al. T2-adjusted computed diffusion-weighted imaging: A novel method to enhance tumour visualisation. Comput Biol Med 2016;79:92-8. Wenkel E, Geppert C, Schulz-Wendtland R, Uder M, Kiefer B, Bautz W, et al. Diffusion weighted imaging in breast MRI: Comparison of two different pulse sequences. Acad Radiol 2007;14:1077-83. 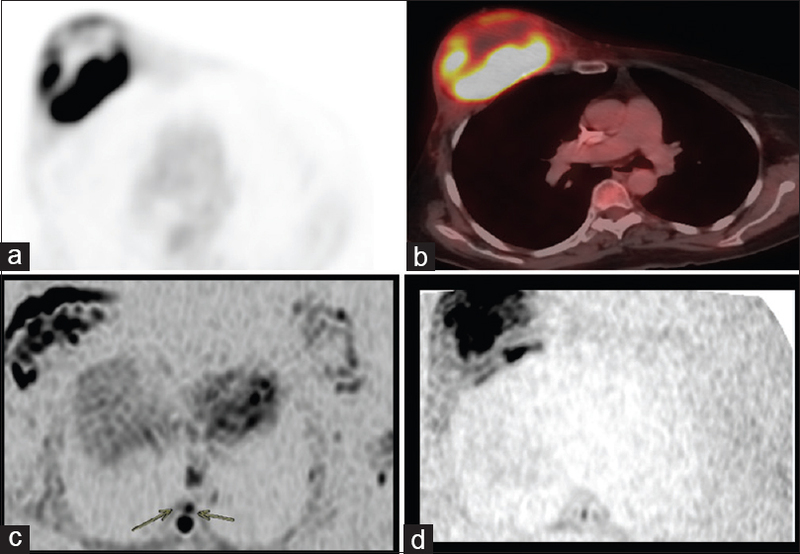 Tsushima Y, Takano A, Taketomi-Takahashi A, Endo K. Body diffusion-weighted MR imaging using high b-value for malignant tumor screening: Usefulness and necessity of referring to T2-weighted images and creating fusion images. Acad Radiol 2007;14:643-50. Tomizawa M, Shinozaki F, Uchida Y, Uchiyama K, Fugo K, Sunaoshi T, et al. Diffusion-weighted whole-body imaging with background body signal suppression/T2 image fusion and positron emission tomography/computed tomography of upper gastrointestinal cancers. Abdom Imaging 2015;40:3012-9.